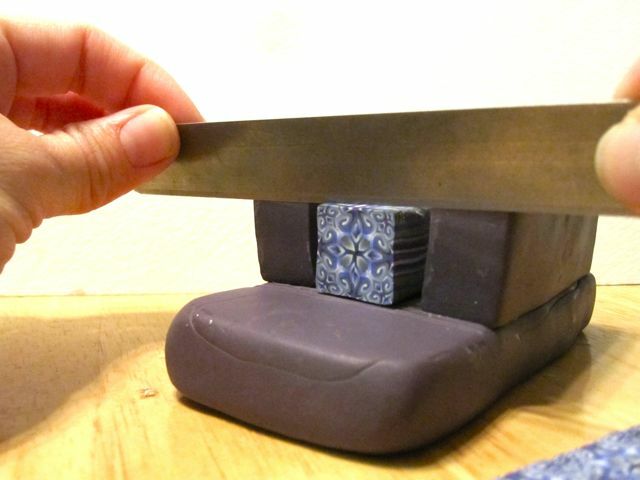 How to cut perfect polymer clay cane slices. I adore making gorgeous polymer clay canes. I think I could make them for the rest of my life and be happy! Here is a list of some of the things I make with canes. There are also tutorials, unbaked canes, and ideas in my etsy shop. However cutting even, consistent slices has never been easy for me. I often waste half my cane with ruined slices. So… here is a tool for slicing canes that you can make yourself! I made the whole thing out of mixed-up scrap polymer clay. I added lines where I would want to measure the thickness of each slice. Next I’ll make one with a rounded bottom for round canes. Remember three things that are still very important! 1) Squishy canes won’t slice well. You have to let the set for awhile. 2) Use a sharp razor or tissue blade. 3) Hold the blade at a slight angle pressing the sharp edge against the walls of the tool as you slide it down. This might even push the slicer back if its not heavy enough. in that case you’ll have to back it up with a book or a wall etc. I hope you’ll be able to make one yourself with these pictures. This entry was posted in Uncategorized and tagged Arts, craft, Etsy, Modeling Compounds, polymer clay, polymer clay cane, Supplies, tool. Bookmark the permalink. 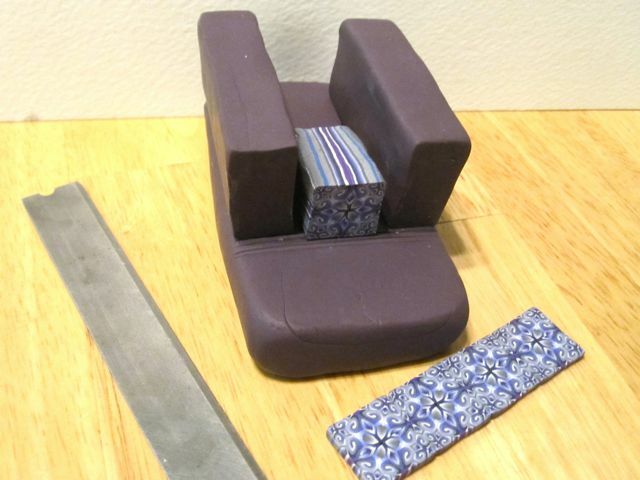 12 Responses to How to cut perfect polymer clay cane slices. Thanks for sharing, what a brilliant idea. 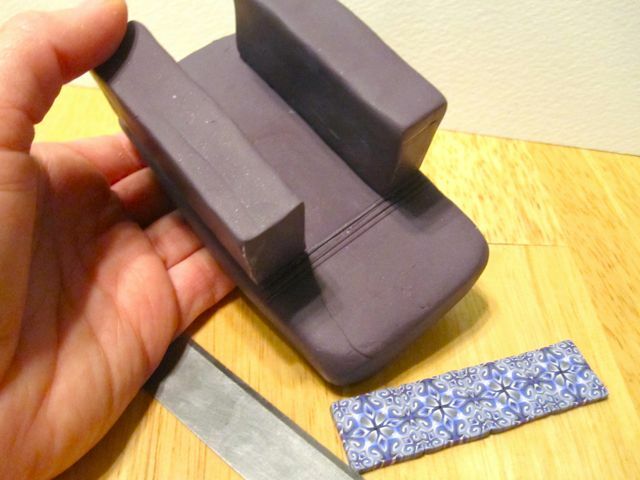 I definitely have to try this – now I know what else I can use my scrap clay for. Thanks for the help, I also need to make one for slicing slabs of clay. I just about took off the tip of my finger the last time I tried to cut a slab of clay. This is a great idea. What a unique and ingenious idea. I have to try this, as I know very well what you mean about “wasted” slices and they usually happen every time, just when you are on the “short side”. Have seen someone’s mechanical invention for perfectly even slices, but don’t plan on spending the big $$$$ they are selling it for. Thanks for this! You are so clever. The tips you give have helped me so much. Thank you so much..
Is the scrap clay baked with the side-walls attached or are they moveable for different sized canes? I baked it on… but of course this design is certainly open to updates! Hi Meg I wanted to let you know I shared your blog with my local clay guild and a few of the glas are really excited to make the cane slicer. Thanks for sharing a great idea! I’m so glad! I hope they work well. May I ask is there any way to move the sides in case you wanted to hold it more secure if it was smaller or larger? Also, how did you bake the size to the bottom did you use any special wiring in between them or anything like that? It’s a good idea to buy the way. No, I didn’t figure out a way to move the sides. And no I didn’t do any special wiring. I wrote this awhile back. I haven’t used anything to help cane slicing in years. Sharp tissue blades and a lot of practice are my only suggestions.